Reefer Madness is a sensationalist, exploitation film of the 1930’s that exemplifies many of the fear-driven, propagandist deceptions about marijuana that continues to permeate culture and public opinion in America to this day. On the ballot in Colorado this November, registered voters will have the opportunity to burn and bury many of these exaggerations and grow the seeds of change out of the dishonest, nitrogen-bearing properties of this corpse known as marijuana prohibition. Marijuana is a gateway drug. Refuting source: U.S. Department of Health and Human Services. Marijuana has been shown to cause mental illness. Refuting source: The Lancet. Marijuana use increases the risk of cancer. Refuting source: Canadian Medical Association Journal. Marijuana is only an effective treatment for conditions stipulated by the Colorado Department of Health and Environment. Refuting source: Ophthamology. Marijuana decriminalization policies will increase the consumption of marijuana. Refuting source: International Report on Drugs. 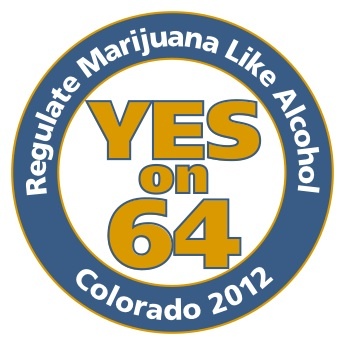 Vote yes on Amendment 64 this November to help reduce the harm associated with marijuana prohibition. Image borrowed from marijuana-photos.info. Yes, we can help put these falsehoods to rest and approve Amendment 64, the Initiative to Regulate Marijuana Like Alcohol. The Amendment will legalize marijuana for adults 21 years of age and older, and will establish a system in which it is regulated and taxed similar to alcohol. It will legalize the possession of up to an ounce and the growing of up to six plants as is currently allowed for Colorado’s medical marijuana patients. Amendment 64 will legalize the cultivation, processing and sale of industrial hemp as a means of boosting our agricultural, economic and environmental sustainability. Additionally, Amendment 64 will funnel the first 40 million dollars in sales-tax revenue to the Public School Capital Construction Assistance Fund. This revenue will be produced through the enactment of an excise tax on the wholesale sale of non-medical marijuana at the point of transfer from a cultivation facility to a retail store or manufacturing facility. Current Colorado medical marijuana provisions would remain unaffected. In reality, marijuana has a wide range of medical applications, its use as a recreational drug is safer than alcohol, and it has not been shown to cause long-term cognitive impairment. Also, its brother hemp can be used to make clothing as one of the strongest natural fibers in the world. Read more about Amendment 64 at Regulatemarijuana.org. Register to vote HERE so that you can help enact this crucial drug-policy reform. Have a happy 420 and please help spread the word about Amendment 64! I thought you work for the goverment, seems like a conflict of interest to me. This needs to be forwarded to your supervisor! You are my supervisor (IP address), so there’s no need to forward it. As for accusations of conflict of interest, I’m not lobbying for changes to the policies of the branch of government that I work for, so that would not apply with this tactical action. Next time please use your real name so that I can leave your comment on here.